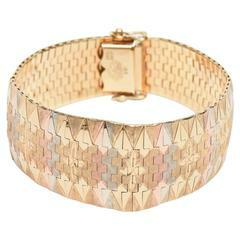 Clean-lined and elegant, this solid 18-carat yellow gold cuff features a champagne diamond set to sparkle at the wrist bone. Diamond measures approximately 2 mm; 0.025 total carat weight. Handmade in London. Hallmarked 750 Allison Bryan London. 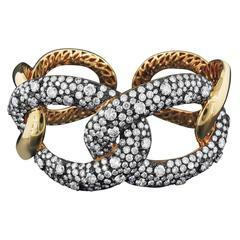 Champagne Diamond and Gold Link Hinged Cuff features 11.87cts of Diamonds pave set in 18k rose gold. Reverse of bracelet features detailed open work on the back. By Damasco, Spain.